I am a member of a re-enactment group which depicts the life and customs of the gallowglass (or galloglaich) mercinaries which lived on the isles off the west coast of Scotland. http://maps.google.nl/maps?f=q&source=s_q...54&z=8 ). What i am interested in finding out is if the image was found on a gravestone, which is the most common source of gallowglass images, or that it was found as a statue or in some other form. Sir James Gow Mann just lists it as an "effigy". That usually implies a carved statue laying down on the lid of a tomb (carved as part of the lid), rather than a free-standing statue. The carving around the statue would seem to lend more weight to the effigy being part of a tomb/sarcophagus lid. It doesn't appear to be a full 3D statue, but more like a raised depiction, somewhere between simple 2D and full 3D. 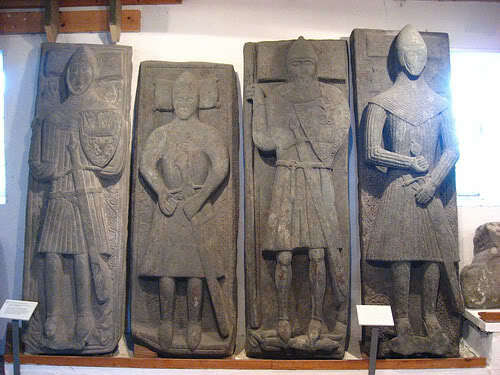 Chad, are there any good books with high-res photos and descriptions of the arms and armour of Galloglaich effigies / gravestones? I have come across about half a dozen different ones on the net, however most of the pics are small and its difficult to see details. Thank you for the replies. Most helpful! @Thom: nice pic! where was it taken?